I absolutely adored the movie and The Short Story! However, both, in my opinion were very, very different. In the film there is no Sheryl, no traveling and no photo. There is a full list of differences; And in the short story Walter is married. However, one thing remained the same: Corky Walter! His personality is just a vibrant from the short story VS the book. I loved him in both! More so in the movie because you get to see him come alive! I love that they added a new flare to Walter in the movie. They gave him such a colourful remake of his life! This is BY FAR one of the most beautiful and wildly entertaining movies I have seen in a long, long(very long!) time. The amazing, eclectic soundtrack is enough reason to give this movie a go, but the pleasant story of this film will keep you entertained to the very end; And absolutely moved to the very core! 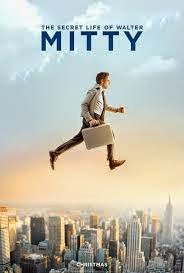 Choosing to watch The Secret Life of Walter Mitty digitally gives you no excuse to miss out on this epic tale! You can take this movie with you on the go, never skipping a beat. What more reason to you need?! Walter Mitty followed me from home to the gym, and he entertained me the whole time through! My favourite Digital Device is my smartphone(Samsung) for all my movies and books. It's small enough for me to tote around easily(because my purse is packed enough!) and yet still gives me a clear, crisp view of all my favourite reads and flicks! Watching Digital HD makes it so convenient. What's better than having access to the hottest, newest releases right at your finger tips? And you can share content with all your favourite devices. The early access to media is an added perk! Google Play gives you this and more! What's not to love? Stay Tuned for a GREAT giveaway pack coming April 18th!